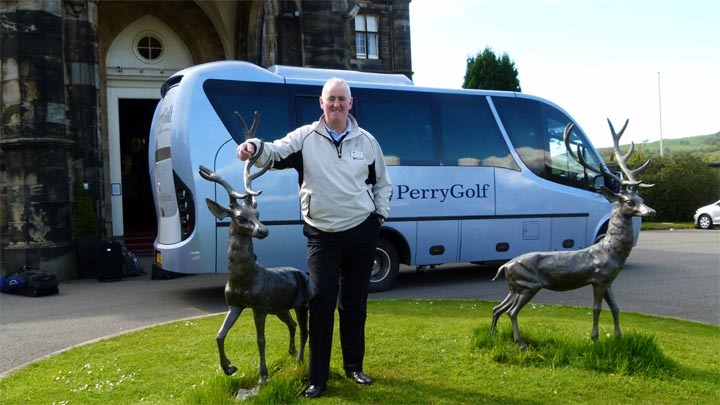 Our ever-dependable and totally personable PerryGolf driver, Angus McIntosh, with the luxury VIP coach in which he escorted us around Ayrshire. When the Golf Road Warriors trekked through southwestern Scotland last week, we didn’t do it on our own. We had an ally in-country in the form of one of the world’s foremost golf tour operators: PerryGolf. Our PerryGolf driver, Angus McIntosh, was invaluable in a host of ways, not the least of which was doing all the driving so that we could rest, or write, or just converse about the experiences we were having. I’ve had the distinct pleasure of traveling with PerryGolf on many occasions — and in many places. 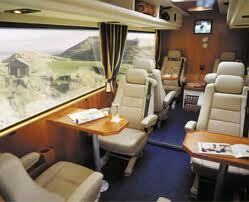 The first time I ever visited Scotland I was traveling with PerryGolf. Ditto for the first time I ever went to Ireland. In subsequent years, I joined the good people of PerryGolf on many other trips to the British Isles, by land, sea and air. My wife and I traveled with them on golf cruises around both Scotland and Ireland — one of which culminated at the Open Championship at Muirfield. We even celebrated our 20th anniversary with PerryGolf in China, where we saw some unforgettable sights and played some stunning golf courses. So this is a company I both know and respect. And it starts with their people. 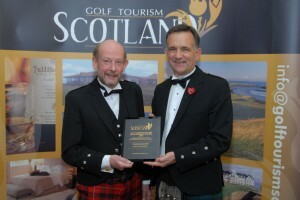 Colin Dalgleish, shown receiving an achievement award from Nick Hunter of Golf Tourism Scotland. PerryGolf is owned and operated by two Scottish brothers, Colin and Gordon Dalgleish. Colin is a former Walker Cup player — and also a two-time Walker Cup captain for the Great Britain and Ireland team. He heads up the company’s U.K. operation from its Helensburgh, Scotland headquarters. Gordon Dalgleish is a fine player in his own right, as well as a respected golf travel blogger and commentator; he’s stationed in the U.S. Together, they’ve built a company that is one of the most highly respected in the business. If you’re thinking of taking a golf trip, you’d do well to consider making it with them. Why can I so readily recommend PerryGolf? Lots of reasons. Golf travel isn’t just a passion for the people of PerryGolf. It’s a business. And while Colin, Gordon and the others at their company pride themselves on having first-hand knowledge of all aspects of the golf trips they arrange, they never lose sight of the fact that it is YOUR trip they’re planning. They put their customers first, and it shows in everything they do. Gordon Dalgleish, PerryGolf's man in the USA. If you’ve ever planned a trip in a foreign country — or even in your own country, for that matter — you know that there are a multitude of details to be overseen. Transportation. Accommodations. Tee times. Caddies. Meals. Finding an ATM. Communicating in a foreign language. Finding your way around — and judging how long it might take you to get from one place to another. Thanks to the internet, a lot of the information you might need to ponder a golf trip is available. But making all the pieces fit together isn’t so easy. Having a company like PerryGolf that can think through every aspect of a golf trip for you is worth its weight in gold. When you’re taking the golf vacation of a lifetime (even if you do so annually), you want things to go smoothly, with no surprises. A company like PerryGolf that has been there and done that is invaluable in this regard. And when something unexpected does come up — like needing to find a pharmacy, or needing to reschedule a tee time because of weather, having an experienced and well connected ally like PerryGolf can give you peace of mind that you’ll be able to roll with the punches without missing a beat. Some people think that using a golf tour operator costs a lot more than booking everything on your own. In some cases, this may be true. But the fact is that most tour operators receive discounted rates from hotels, golf courses, etc. and this is reflected in their rates. Oftentimes, you can take advantage of the golf tour operator’s expertise without paying much more than you would if you booked on your own. Plus, tour operators often have access to things you couldn’t get access to yourself. Like guaranteed tee times on The Old Course. And at the end of the day, when you think about all the time you’d spend booking everything yourself, whatever you pay on top of that to tap into the expertise of a company like PerryGolf is a small price to pay in my opinion. 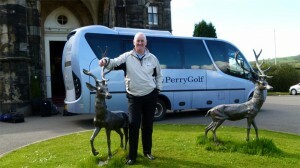 PerryGolf's VIP coaches let you travel in comfort and style. No matter how much you think you know about golf travel, it’s likely that a tour operator like PerryGolf knows more. Not only can they probably arrange a smarter itinerary (and save you time and money in the process), they can also think of things that you might not. Like making a stop to see Archie Baird at his golf museum in Gullane. Or arranging some time with “Old Tom Morris” in the form of actor David Joy. Sometimes, it’s the things you don’t know that can make a tour operator like PerryGolf so valuable. Because of their heritage, the Dalgleish brothers and their PerryGolf staff are a great choice for trips to the British Isles. But their programs extend far beyond places where the King’s English is spoken. Take a look at the PerryGolf website and you’ll see that they offer lots of other programs, from golf cruises in the Mediterranean to excursions to New Zealand to barge cruises down European rivers. This year, they’ve even added golf trips around Nova Scotia to their offerings. What’s more, PerryGolf has expertise in planning and operating trips for groups of all sizes — from groups of more than 100 like the cruises I was on, to small groups like our Golf Road Warriors group, to couples programs. They take good care of the non-golfers in their charge, too. My wife didn’t take a single swing during our trips and she had a blast seeing all the gardens, museums, national parks and even distilleries. PerryGolf isn’t the only golf tour operator with experience at this level. There are a handful of companies that have very good reputations for delivering seamless golf travel experiences, and I know and could recommend several of them. But PerryGolf is the company I’ve traveled with most and one of the companies I know best. So I can heartily recommend them to anyone looking to take a golf vacation. Who knows — if you’re lucky, you may even get Angus McIntosh as your driver. If you do, though, don’t ask him about our Golf Road Warriors trip. When it comes to those details, he’s sworn to secrecy.